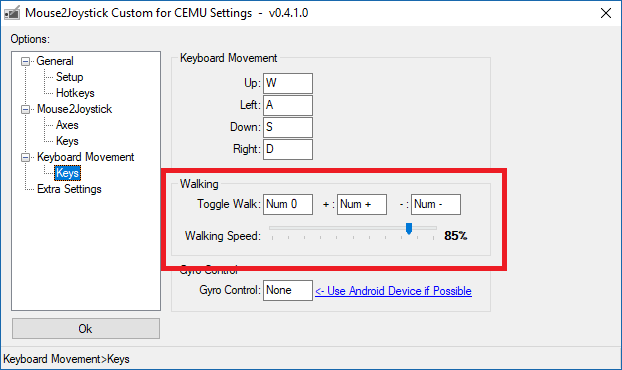 In your CEMU input settings make sure the dead-zones are low (1-10%), also make sure you are using the latest version of both the script, and CEMU as there were dead-zone bugs that have been fixed at some point. thank you for your quick reply. unfortunately all your suggestions already applied to my setup. but i already found a solution - i use the vxBox output instead of the vJoy. I have followed all of the steps exactly, but when I open input settings in cemu and click on the drop-down menu for profile, nothing shows up. Make sure you've extracted the controller profile text documents to the correct location. Which would be the "controllerProfiles" folder in your CEMU directory. I just tried vJoy out and everything works perfectly. However, the + and - from CEMU don't work, no matter what key I attach to mouse2joystick on them it won't open the menu or the map. Camera works fine and every other input as well, what might be wrong? I'm using this for a PC game, the game is designed for an 360 controller so i use x360ce with this. Controls are fine but problem is that the game keeps pausing, any idea on what might be causing this? That is weird, I've not experienced selected keys not working. I'd make sure that you have set up vJoy with enough buttons in the config, and double check in CEMU input settings that it looks like +/- have keys mapped that say "Button"
I'm not sure on this, what key is mapped the start/pause key in game? Have you tried using the builtin vXbox? it simulates an Xbox 360 controller directly, and you won't need to use x360ce at all. I understand why vXbox wasn't working, i had to install ScpVBus which i thought i already had. Problem is i'm having trouble with keyboard movement, these are ok in BOTW but in other games when i try moving forward or right then it's slow, moving left or down is ok and at full speed. Is there a convenient way to control the position of vjoy? The earth temple in WWHD need player to reflect light at some certain locations, if I press W it just go all the way up, and rests if I don't..
Last edited by NAVras; 10.04.2018 at 11:06. If you use the source version on GitHub that hasn't been released, I added the ability to customize the "Walk" speed. This basically lets you limit the max simulated movement of the left analog stick with the movement keys. I also added HotKeys to adjust those values on the fly while controlling ( default to + - on the numpad ). Also somewhere out there I have a version made that allows you use the mouse to control the left stick while a key is being held down... which was specifically for WW shield holding. I will look for where I saved it and maybe add a special option for WW that toggles automatically using that feature when the shield key is held, but no promises on that as I haven't had much time to spend working on this project lately. Last edited by NAVras; 17.04.2018 at 09:00.